Save for the most wild-eyed mountain man, every man should own a razor. That goes for guys who want to keep it smooth like D’Angelo or grow some sweet mutton chops like Chester A. Arthur. Yes, store-bought disposable razors will do the job, but some people like to tame their face and body hair in style. There are people who swear by Braun’s top-of-the-line Series 7 shavers, which start at around $200, let men shave in the shower, promise to actually reach those weird areas under your chin and practically clean themselves. They do not, however, use lasers. The Panasonic Series 9000 Beardtrimmer ($100) does. 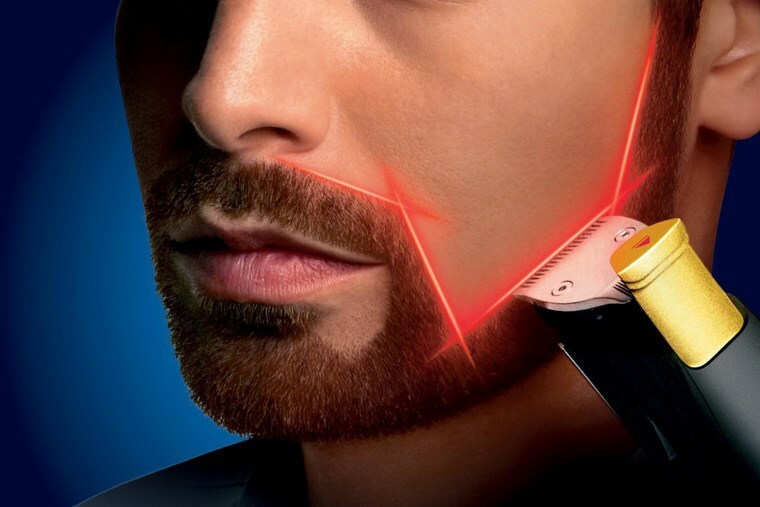 Yes, uneven sideburns are toast thanks to this device's "unique laser guidance system" that projects a straight red line. It's like a sniper, for your beard. For those who like to charge their personal grooming devices while posting on Facebook, there is the ShaveTech electric razor ($29.99). It kind of looks like an iPhone and it plugs into standard USB ports. Hopefully men know better than to shave over their MacBook Air keyboards. But what about people with hairy backs? Who is looking out for them? Mangroomer ($59.99), that's who. No, it's not one of Hall & Oates' greatest hits, it's an electric shaver connected to an "extendable ergonomic rubberized handle" that lets people reach the nether regions of their back. The straight razor has been around since around 1680. Of course, periwigs and puffy breeches are not in style anymore. Why should men still shave with a straight razor? Because they offer extremely close shaves. In New York City, high-end barbershops have been pairing straight razors with amenities like scented towels and craft beer. Daring dudes can try it at home with one from Hart Steel ($269) or go all out with the $895 Bison x Max Sprecher Straight Razor, which comes with its own leather case. Gillette made a big deal about the "swiveling ball-hinge" on its Fusion ProGlide with FlexBall Technology, its most expensive razor ever ($11.50), which was unveiled at an event in New York City on Tuesday. The critics have spoken ... and it doesn't seem like it's that different from what came before it. One alternative: Harry's, a shaving start-up that sends people a handle, three blades and a tube of cream for $15. Its spring collection has a retro feel to it, like something Don Draper might have used while visiting Palm Springs. The company's "shave plans" let customers order renewal kits (including new blades and shaving cream) every few months, depending on their desired level of stubble. Men emboldened by this brave new world of shaving can register for the World Beard & Moustache Championships, taking place in October in — you guessed it — Portland, Oregon.